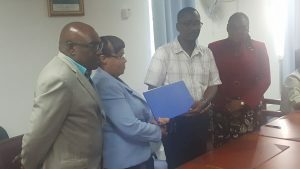 Chief Education Officer, Marcel Hutson (extreme left) and GTU General Secretary, Coretta Mc Donald (extreme right) look on as GTU President Mark Lyte and Permanent Secretary of the Ministry of Education hold the signed agreement. Government-employed teachers would get between 8 and 12 percent salary increases and an 8 percent across-the-board increase for 2018, but there would be no increase in allowances. Those are based on agreement signed on Wednesday between the Guyana Teachers’ Union and the Ministry of Education. The agreement states that teachers earning below GY$100,000 would get 12 percent increase on their 2015 salaries, and those earning GY$100,000 and above would get an 8 percent increase. The two sides also agreed that the interim 8 percent and 6 percent on December 2016 salaries that were paid in 2017 would be final. That was 8 percent on salaries below GY$100,000 and 6 percent on salaries GY$100,000 and above. The teachers had gone on a two-week strike in late August to early September, 2018 to press demands for arbitration, but after talks had collapsed with the Labour Department over the chairmanship of the arbitration panel, President David Granger intervened a second time and re-opened negotiations. At the time of agreeing to arbitration, the union had said it would have been willing to accept 20 percent instead of 40 percent for 2016 and five percent annually for 2020. The two sides agreed that teachers would be placed in their respective salary scales from January 2019 to reflect the results of the de-bunching of teachers. GY$350 million have been set aside instead of de-bunching for 2011 to 2018. According to the agreement, the teachers would “continue to receive the approved rates for improved qualifications” which are have been set at GY$4,000 for Certificate in Education, GY$6,000 for Diploma in Education; GY$10,000 for a Master’s Degree, GY$30,000 for a Doctoral Degree and GY$10,000 for Special Needs teachers. The GTU and the Ministry of Education also agreed that teachers would be paid the GY$8,000 annually for clothing allowance. Further, that increases for clothing, station/hardlying, risk and travelling allowances “will be considered in line with the review of these allowances for the wider public service”. In terms of Duty Free concessions, 100 would be made available annually for vehicles up to 1800 CC to eligible teachers and All Terrain Vehicles and outboard engines up to 75 Horse Power for eligible teachers in the riverine and hinterland areas. Those who will be eligible for those duty free concessions are head teachers/ principals, deputy head teachers/ principals of Grades ‘A’ and ‘B’ schools, institution, immediately on their appointment with three years remaining before retirement; all headmasters, mistresses, administrators of Grades ‘C’, ‘D’ and ‘E’ schools/ institutes after three consecutive years in their appointment with three tears remaining before retirement; all senior masters/ mistresses and heads of departments of all schools and Lecturer 11 of Cyril Potter College of Education/ Craft institutions after six consecutive years in the same position after their appointment. Those persons in the those categories must be members of the Guyana Teachers Union for not less than three years and must have at least three years remaining before retirement. In terms of scholarships, the Ministry of Education agreed that 30 teachers “will continue” to receive scholarships for four years at the University of Guyana to pursue a Bachelors of Education, and an additional 20 will be granted scholarships to pursue Science and Technical Education at the University of Guyana. The Guyana Teachers Union and the Ministry of Education also said they “shall mutually agree on a mechanism for the implementation of the Housing Revolving Fund. The President and the General Secretary shall be released with pay on a full-time basis to serve the GTU’s membership, and all General Council representatives, with the relevant approval, shall be released to attend to teachers’ matters, and all Central Executive Officers shall be released to perform GTU duties every Wednesday and from time to time.